I thought I should make a Valentine's Day card since Valentine's Day is coming up. This was a fun and quick card to make. I used the new "Sure Do Love You" set to make this card. The base of my card is a folded half-sheet of Whisper White card stock. On top of that is a piece of the "Color Theory" Designer Series Paper (DSP) stack. I like these stacks because there's so many fun 6" x 6" papers in them. And just like the 12" x 12" paper pack, I never seem to use them all up! I cut that piece 4" x 5-1/4" and I taped it to the front of my card. 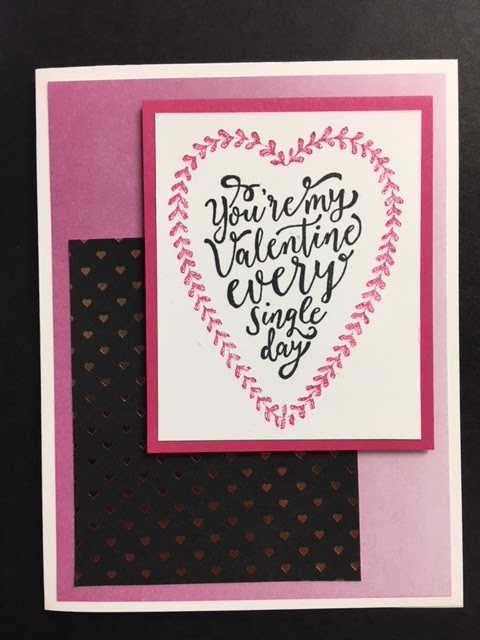 Next I took a 3-1/4" x 2-1/8" piece of Whisper White and I stamped the heart from the "Sure Do Love You" set using Melon Mambo ink. The words are from the same set and I stamped them using black Memento ink. I cut a 3-1/2" x 2-3/8" piece of Melon Mambo card stock for the layer. The black piece with the metallic pink hearts is from the January "Paper Pumpkin" kit. It was a pocket but I cut it to 3-1/2" x 2-3/8". I taped it to the bottom left corner. I set the layered word piece down using Dimenisonals. And that was it. A very quick and easy Valentine's Day card.